Arrival Leh Kushok Bakula Airport (3500 m / 11565 ft above sea level). Upon arrival at Leh Kushok Bakula Airport welcome and meet by our representative and transfer to Hotel/Guest for check in wherein welcome tea and coffee will be served. Complete half day rest at hotel for acclimatization as it is important at the height of Ladakh. Lunch will be served at 2:00 PM. Afternoon around 3:30 PM sightseeing to Shanti stupa, and 17th century Leh palace. Dinner & overnight at Leh in Hotel/Guest house. 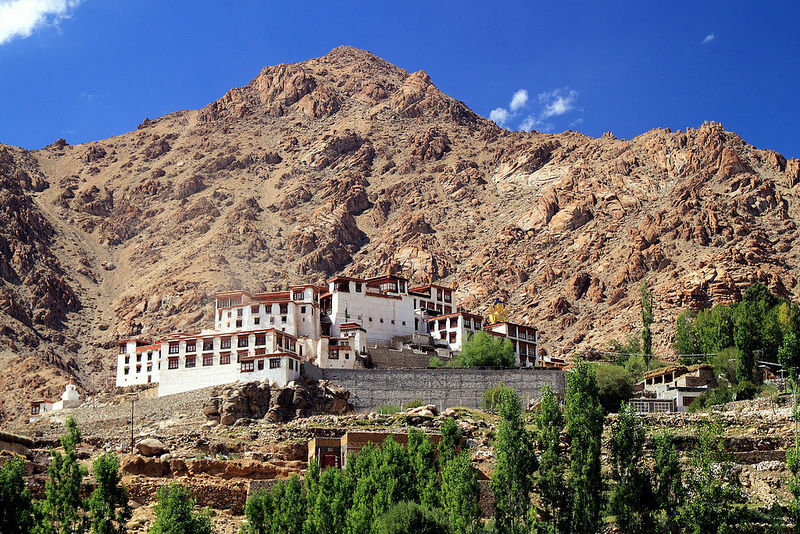 Leh – Sham valley – Leh. (Round 240 Km - 8/9hrs). After breakfast you drive downstream along the River Indus on Leh – Kargil Highway. Enroute visiting, Magnetic Hill which defies the law of gravity and panoramic view of Indus – Zanskar River confluence. After confluence drive to Likir monastery biggest Gelugpa monastery in Sham valley, monastery have beautiful wall painting of tantric deities which was hand work famous Ladakhi artist who was master in Tibetan Buddhist arts and on the side of monastery 87 feet statue of Maitreya Buddha. After Likir monastery drive to Lamayuru and take photo of panoramic landscape of Lamayuru popularly known among the tourist as moon landscape and picturesque Lamayuru monastery. Lamayuru monastery have three portions, oldest part is Singgay Lakhang builted in 11th century by Lotsava Rinchen Zangpo, second parts was builted in 12th century, third was new one builted in 18th century. After visiting Lamayuru monastery drive to Alchi monastery on the same way back toward Leh. Lunch at Alchi in Restaurant. After Lunch visit 11th century Alchi monastery, listed in world heritage site. After Alchi drive back to Leh on the same road. You will reach Leh around 6:30 PM. Dinner & overnight at Alchi in hotel / Guest house. 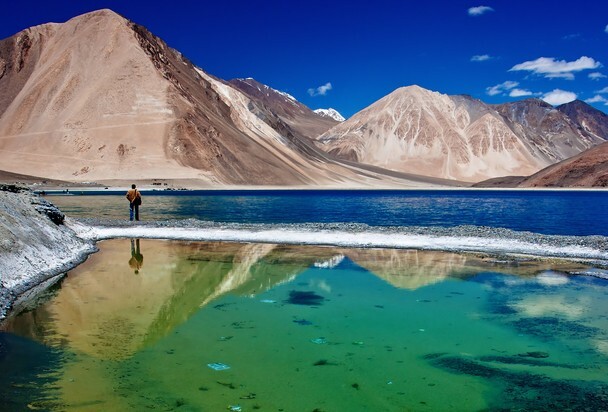 Leh – Pangong Lake (140 km one way 4/5 hrs). En-route visit Thiksay monastery. Today after early morning at 5:30 AM leave to Pangong Lake enroute sightseeing of Thiksay monastery and attend early morning prayer of monks and thereafter visit monastery shrine rooms. Than drive to Pangong lake pass through the Chang-La pass 17,350 feet. (The third highest motorable road of the Ladakh). Short stop at Chang-la pass to view panoramic view of Sakti village and Changla glacier. From Chang-La pass drive down passing through panoramic barren mountainous landscape, after around 2 hours drive passing barren mountainous landscape you reaching Tangtse village. Tangtse is main village of Changthang region with administration offices, hospitals, small market and few guest houses and there police check point where taxi need register their vehicle number and foreigner tourist need register their passport and visa validity. Short stop at Tangtse village for tea and to stretch your legs after long drive. From Tangtse to Pangong lake around 40 km – 1 hour drive. You will arrive at Pangong Lake around 12:30 PM or 1:00 PM. Check into Deluxe camp for hot lunch. Post lunch hike around the lake to enjoy the grand panoramic view of Pangong Lake and surrounding landscape. Dinner & overnight at Pangong in Deluxe camp. Pangong Lake to Leh by same route via Changla pass Enroute visit Hemis monastery. (140 km – 4/5 hrs). Today don’t miss to wake up early morning if you like to take photos sun rising view of Pangong Lake. After sun rising view of Lake back to camp for breakfast at 7:30 or 8: 00. After breakfast return back to Leh by same route on the way visit 17th Hemis monastery. Lunch will be at Hemis monastery in Restaurant. Post Lunch drive back to Leh you will reach Leh around 5:00 or 6: 00 PM. Dinner & overnight at Leh in Hotel or Guest house. Leh – Khardong-La pass (18,390 Ft) – Leh. (39 Km one way - Round 78 km – 4/5 drive hrs). Today after breakfast at 7:30 AM drive to Khardong-La pass top 39 km from Leh. (The Khardong-La pass is one of the highest motorable pass in the world 5,602 Mtrs. / 18,390 Ft above sea level. While drive upto to the pass on zig-zag mountainous road on the way stop to takes the photos panoramic view of Leh town and Zanskar range. On the top of Kardung-la pass grand panoramic view of Zanskar range and whole Leh town. After enjoying the view at Khardung-la pass top. Drive back to Leh on same route and you will reach Leh around 12:30 or 1:30 PM. Lunch at Leh in Hotel. After Lunch stroll around the Leh market. Dinner & overnight at Leh in Hotel / Guest house. Flight Leh – Delhi. After early morning breakfast transfer to airport and fly back to Delhi with Sweet Memories of Ladakh. Tour and Service end. Meals Plan MAP (Daily Breakfast + Dinner). To & Fro Leh Airport Transfers, Transportation by Non A/C Innova, Xylo, Tata Aria as per mention tour plan (Point to Point). Any Kind of Personal Expenses or Optional Tours / Extra Meals Ordered. Monument Entrances, Camel Safari Charges, Anything not specifically mentioned under the head "Prices included", Tips, Insurance, Laundry, Phone Calls, Any Kind of Drinks (Alcoholic, Mineral, Aerated). Cost incidental to any change in the itinerary/ stay on account of flight cancellation due to bad weather, ill health, roadblocks and/or any factors beyond control. Monasteries entrance fees INR- 600.00 per person. Inner – line permit for foreigner tourist INR- 700.00 per person. Cultural program INR 10000 per program. Two Hump Camel Ride at Nubra Valley at Sand Dunes: INR 400 (15 Mins) / INR 700 (30 Mins). &COPY; 2017 Rizz Tour and Travels. All Rights Reserved. Trip Planning Stage Select Trip Stage Still dreaming... not sure i'm going to take this trip. I know i'm going to somewhere, just not sure which place. I'm definitely going, i know which place... let's go! Flight-Train already booked,just need remaining package.